What is your favorite Ramen noodle flavor? Most college students can easily answer this question. Eating Ramen for every meal is a “scary story” most graduating high school seniors hear as they are about to go off to college. The stereotype of “poor college kid” is one that is pretty valid. College students spend money on books, rent, and other “necessities.” After all of these expenses, most students are left living on a strict budget, and looking for discounts anywhere they can find them. There are many companies that blatantly market towards college students, and have discounts that almost all students know about (for example, Apple and Dell). But there are also many other stores and services that offer students discounts. Unfortunately for us college kids, they aren’t as well-known due to the lack of advertising. Living in a college town can increase business, especially if the business offers student discounts. One of the best ways to market to students is giving away free things and food, but also providing a student discount. The companies in the chart below are ones that offer student discounts that most students probably don’t know about. The way to a college student’s heart is offering them an “exclusive” discounted price. This offer isn’t just for anyone, it’s a perk for the special crowd that is “poor college kids.” Commodity culture states that we define ourselves by the things we buy. If something offered is “exclusive” it immediately becomes more valuable because not everyone can have it. Not only will a student discount attract college students because they can save a few dollars, but also because it is an exclusive offer that only students with a student ID have access to. With that being said, a student ID can still come in handy even to college graduates, for a little while longer at least. Isn’t everyone’s favorite ramen flavor chicken? I enjoyed this post and hearing about the additional college discounts offered by local businesses. I think it’s true that college students are always looking for ways to save money and offering discounts for customers with student IDs is a great way to establish exclusivity that can draw people to the brand. I’ve seen local businesses like Hibachi Bistro that have “ID Discount” nights. These promotional nights benefit anyone with a specialty ID including teachers and medical staff. I think this is a nice addition to student discounts because they still promote exclusivity for the brand, but also allow for more consumers to participate, generating more business. You bring up a great point that including additional groups to offer discounts too is important. We need to take care of our teachers and first responders as well! I don’t know if I love or hate this post because I never knew of the 10% student discount for McDonalds or Subway which would have been amazing as a college student the past three and a half years. Burger King, ehh that would have to be a 100% student discount. It’s amazing that this isn’t more commonly known or marketed at all by these companies because it would certainly help their sales out at least a little bit. Cookout is so big to college students because a whole tray is only five dollars and change. Price is everything to us! Thank you for your comment, Griffin! 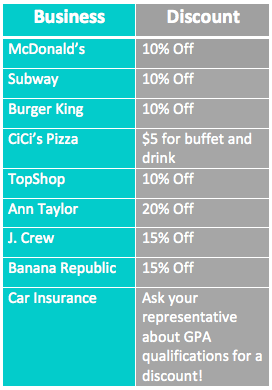 We too were surprised by how many well-known chains offered student discounts! You’re right, price IS everything to college students!